There are more than 650 types of air plants, scientifically identified as Tillandsia, that can grow—and thrive—without soil and come in all sizes and colors. Air plants are probably the easiest plant to grow so it's perfect for gardeners who tend to have a "black thumb." Although air plants used to be a rare greenery, these hardy plants have become popular in the past couple years. 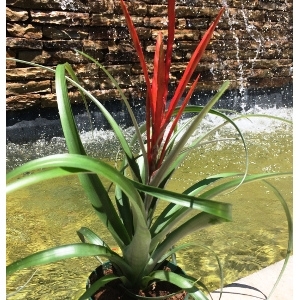 Many air plants grow with strap-shape or slender triangle-shape leaves, and most have attractive tubular or funnel-shape flower and are native to the southern United States, Mexico, Central America, and South America. The key to air plant survival is constant air circulation, as its name indicates. Air plants need water about once a week—some varieties can go two weeks without being watered. To water them, they should be placed in the sink and each plant lightly rinsed. Leave the plant in the sink overnight to drain and put them back in their designated place in the morning. Although they love warm weather, most air plants need protection from full sun. Air plants look great alone as architectural elements or in an air plant terrarium. With very little up-keep required, they are a nice green addition to brighten any setting regardless of the season.